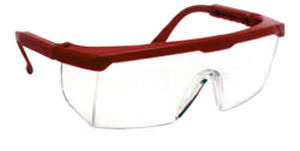 •These safety glasses feature lightweight wrap around protection. The frames are adjustable at the temple for a comfortable, custom fit. The molded nose bridge prevents slipping. Meet or exceeds ANSI Z87.1-1988.